I was minding my own business when the rain came blowing in. Torrential, cold mucky windy rain. Thunder and lightening too. Thank goodness it wasn’t snow. You would think we live in prehistoric times, because every time it rains we lose our phone and internet services. Ok, I realize we didn’t have these advanced technologies when the dinosaurs were roaming the earth. Seriously though it is 2014, why does a little rain cause such an outage and more importantly, why does it take the phone company so long to fix it? I’ll give them credit, though it was only two and half days this time until we miraculous had connection again. Also along with the rain and wind came a howling head cold. Where’d that come from? I’ve had lots of tea and honey, and once just a splash of whiskey – for medicinal purposes. Today the sun is shinning so brightly. 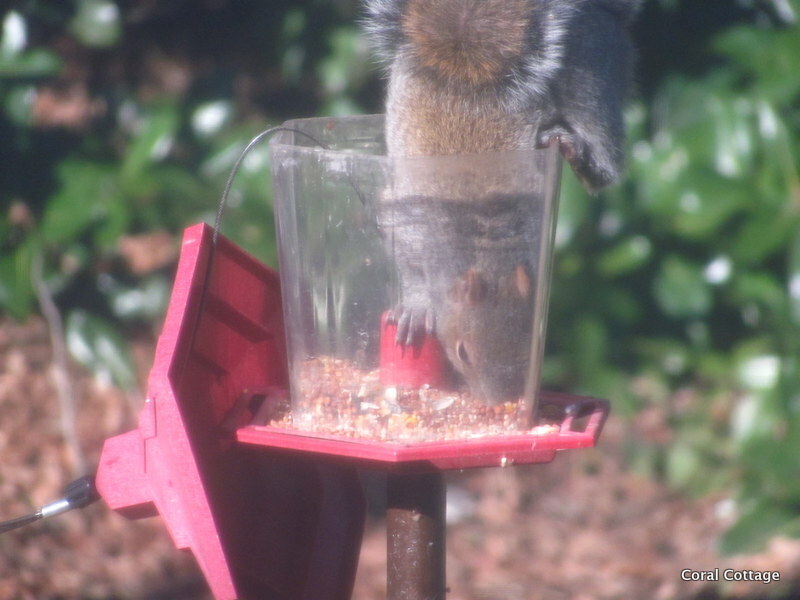 Mr. Cottage cleaned and filled all the bird feeders that got gunked up, the last few days, because the squirrels have figured out how to pull the tops off of them; sit inside and eat the seed, leaving it exposed and wet from the rain, thus a gummy gunked up mess. 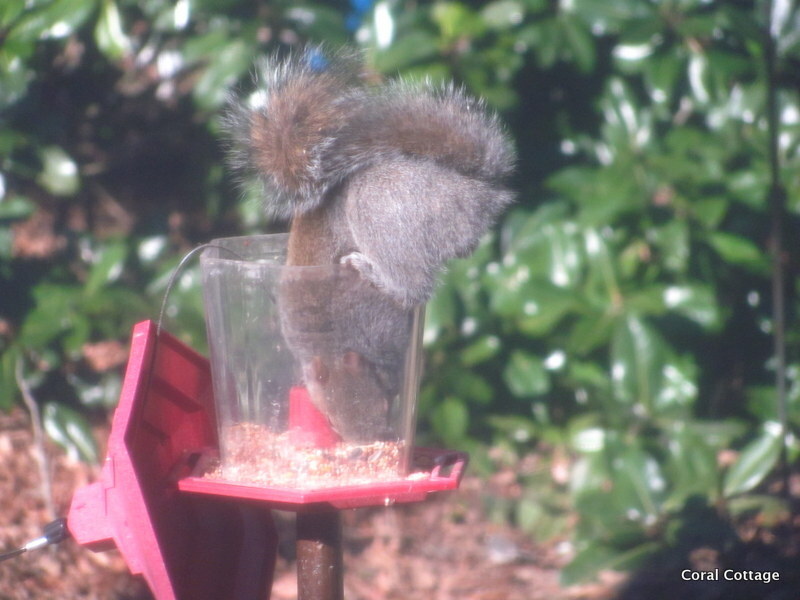 I thought I had out-squirreled them, because I had taken petroleum jelly and rubbed down all the poles the feeders are on. That worked for awhile, and I got great amusement out of the fact that they slid all the way down to the ground, unable to hold onto the greasy pole. I catch the little fuzzy rat in action. 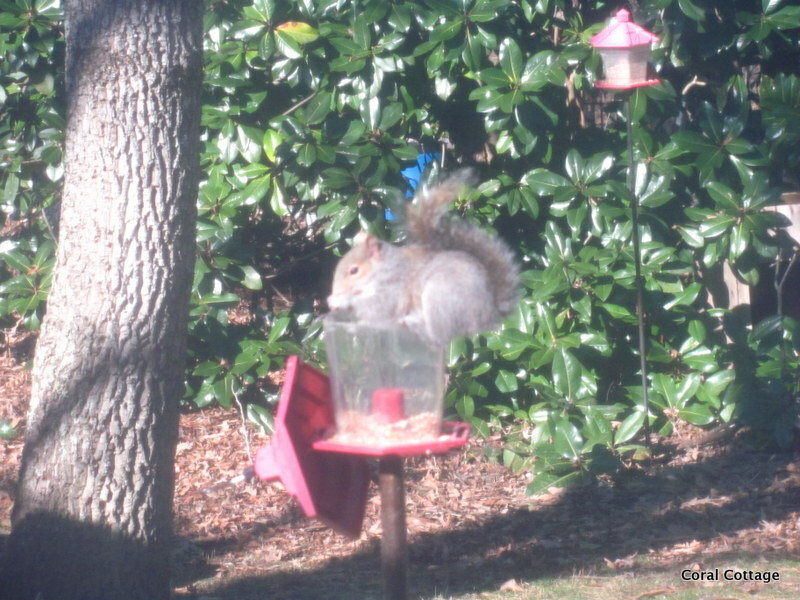 Don’t send me hate mail – I have two designated squirrel feeding stations, so that they get fed, and so they will leave the feeders alone. Greedy little B——-. 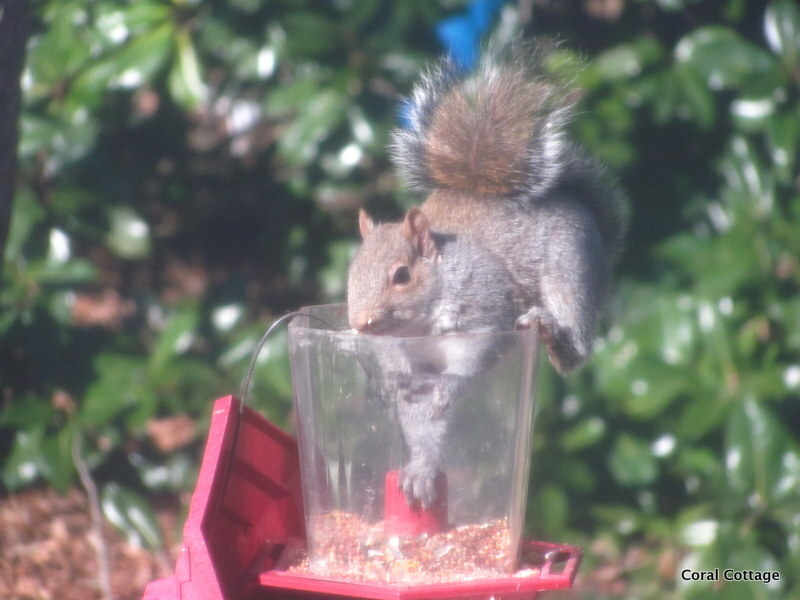 Today, with the filled and clean feeders the birds are happily eating and singing and there isn’t a squirrel around. That is kind of strange. They must be off plotting some kind of take-over. Rainy days are good for puzzle time. Then the white nemesis makes an appearance. An ugly confrontation occurs, and then the stare down. So I end up having to put the puzzle away, so I don’t have pieces spread from one end of the room to the other. And so goes Life at Coral Cottage. Hope you are safe from the weather and having a good weekend. Kim of Red Dirt Farm • This entry was posted in Country living and tagged cats, puzzles, squirrel. Bookmark the permalink. 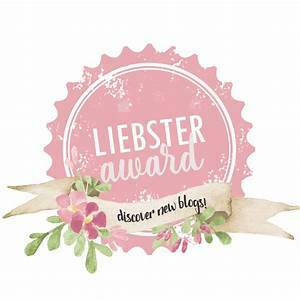 Now why did you go and revise the name of your blog. That line about moonbeams and stars always made me happy. Now I’ve got to read to the third line to get happy. My, but you have clean windows if you can photograph through them and get such sharp shots. You tryin’ to make the rest of us look bad? You are probably losing your phone connection because the cable box gets wet. What a blow it is to be out-squirreled and now the gangstas are plotting a take-over! I think Poppie sprays WD-40 on his post. What you need is some inexpensive fire power. Maybe a BB gun. You could sit on the porch and pick the little boogers off. I do puzzles in the winter, too, but not for the last few years. I’ve actually been to that Neuschwanstein Castle but it was many moons ago. Speaking of moons. It’s crooked tonight because it’s not quite full. Do you know where the line Catching moonbeams in jars came from? I just bet you do. Sorry I put a kink in your reading format. I’ll see if I can fix it for you. WD-40 might have to go on the poles too, but for the life of me, I know something is about to happen because those little boogers have disappeared, it is the strangest thing. They are definitely up to something. Phone company came this morning and unfixed my fixed phone and internet so that they could fix it. Wasn’t that nice of them? If you understand all that – please explain. Naw, I didn’t know where catching moonbeams in a jar came from – I just liked the sound of it. Seems it came from Frank Sinatra. He’s a tad before my time. I came along with Elvis and the Beatles and you LOOK like you did, too. Or maybe later with the Monkeys. Our squirrels NEVER disappear. Wonder if they are working on their nests? It’s going to get cold again down this way. I get really hot when my internet doesn’t work. Am addicted to social media. Except Pinterest, thank gawd. Wouldn’t get anything done if I was addicted to all of it. Bing Crosby – a line from a song in the movie Going my Way. It was about making decisions to make good of yourself or take the wrong path. I prefer movies made before the 60’s. Yep, I’m an old movie fan. Usually when I say that someone will come back with oh yeah I like such and such movie made in 1980. Not even close. Sinatra over the Beatles, Elvis is King – Monkeys were silly. I guess I have a thing for old. Which is a good thing, ’cause I am starting to wear it really well. Ha! 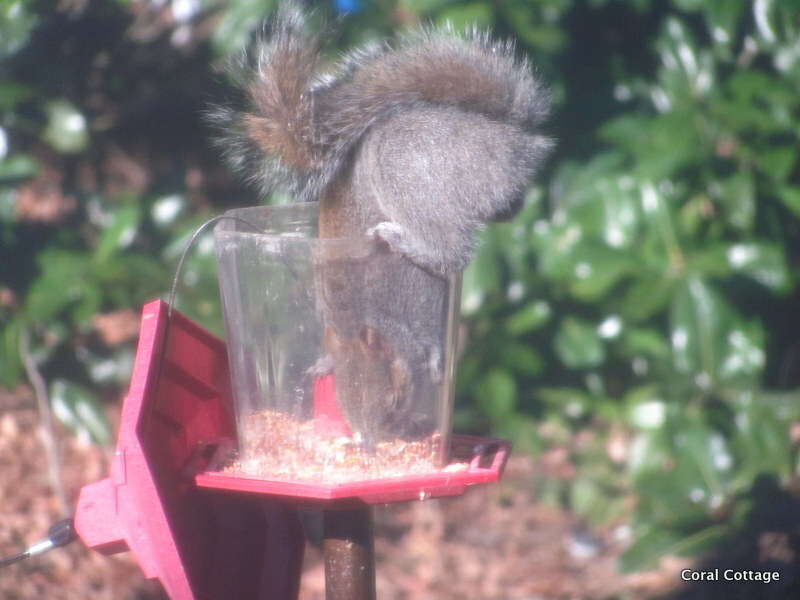 I am laughing so hard at the squirrel warfare. We have an ongoing battle with them, as well. I have not tried petroleum jelly and now can’t wait to give that a go!! I hope your head cold ends quickly. Certainly your remedy of tea & whiskey will warm your heart & soul if not cure the ache. Peace to you! I’ve been easily amused during my house bound time. Slicking up the bird feeder poles was high on my list. No acorns this year so the little buggers have been into everything and very destructive. Cat’s are entertaining themselves with squirrel dreams. Cold is on the way out. Go give your poles a slick down and let the fun begin! Love and hugs! 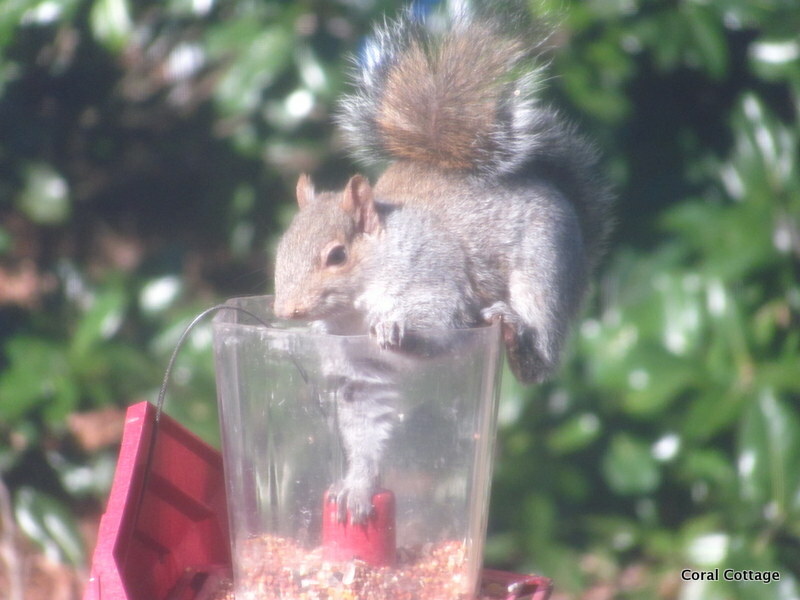 Hi Kim, Maybe the squirrels were too full after eating all that bird seed! Glad you are reconnected again! Charles said I was feeding them too well, because they are so fat. Maybe so, I think they are plotting revenge. I can hear the chatter up in the trees. 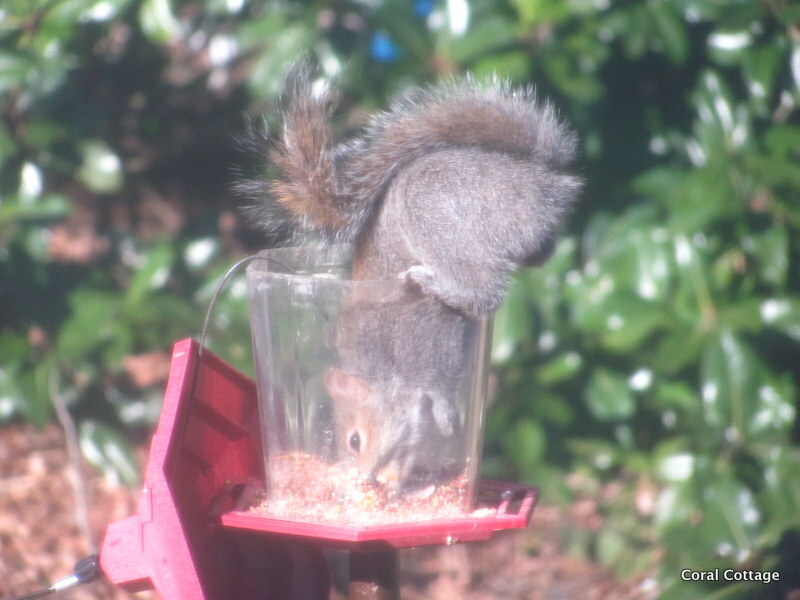 The squirrels are so sweet, but they sound a little annoying like our possums! Fabulous photography. Perhaps they are off designing shoes that stick on Petroleum Jelly…. 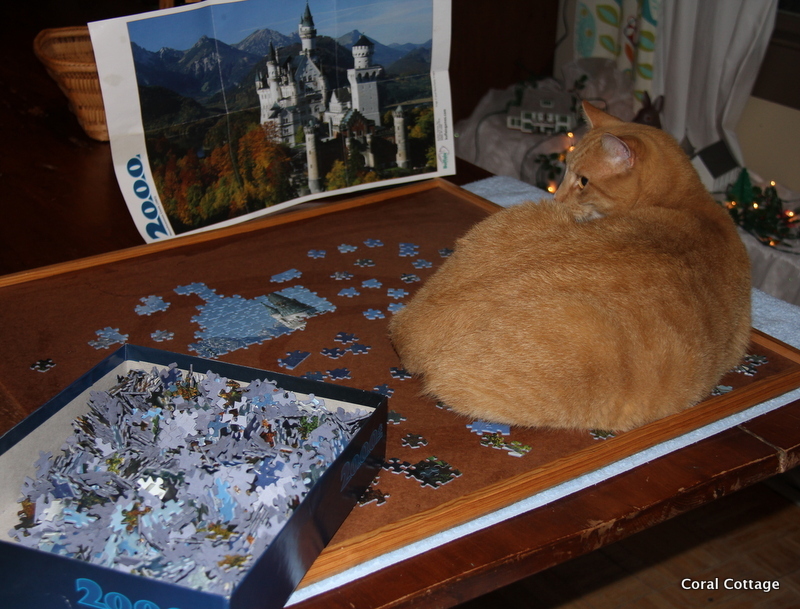 So sorry you had to put your puzzle away! 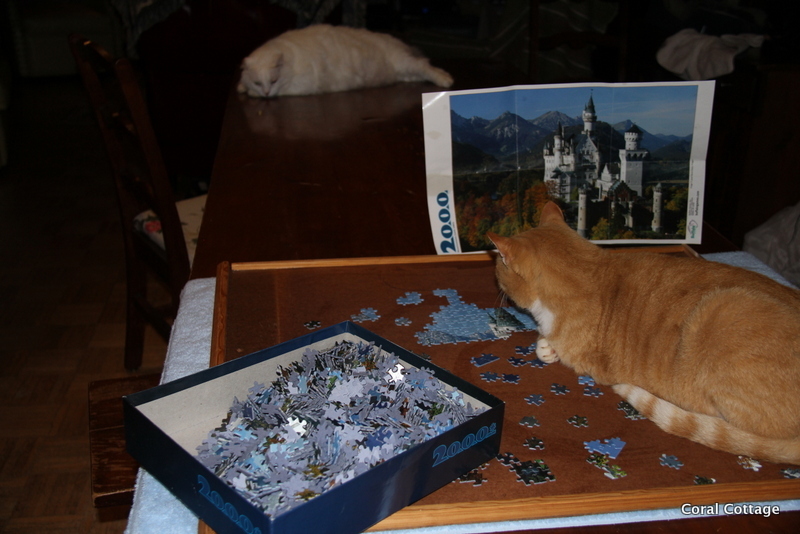 We’ve been doing puzzles at our home, too. My oldest son received a Seattle skyline puzzle for xmas from his sister (who lives there now). We all had such fun putting it together that I bought some more puzzles. Next we did a vintage truck that had gas station signs background…it wasn’t too big and didn’t take too long. However, next was a 2000 piece Las Vegas strip at night puzzle….it’s an adventure putting this one together! We are almost done now…perhaps another 100 or so pieces, of course the most difficult ones that are almost all black etc. The last one we have to put together is a bunch of penguins…that will be a real challenge! Peace to your heart, Kim.